A Corporate Drive Day program can be tailored to suit your objectives, budget, time constraints and the number of participants. We offer off-the-shelf formats which are extremely popular or design your own day from our activities list below, to create a package that will thrill the pants off your guests! The type of driving activities that can be conducted depend on the venue/facilities, budget, timeframe and number of participants. Typically the group will be split into teams of 10 - 15 participants and each activity requires 60 - 90 minutes. EXAMPLE: For a group of 48 participants available for the entire day, the group can divide into 4 teams of 12 and rotate through 4 simultaneous 80 minute driving sessions (2 before lunch and 2 after lunch) with the possibility of combining at the end of the day for a final event (ie. Hot Laps/Thrill Ride). Advanced Driver Training: Participants can undertake modules from our Advanced Car Control course such as evasive lane changing, cornering, slalom, skid control and emergency braking. This training can be conducted on a slippery surface to replicate wet weather driving conditions or even on gravel/dirt. We can show your guests how technology like ABS, EBD, ESP and traction control works. NOTE: By running driver training activities the program can be classified in the training budget and can assist with the on-road safety of participants. Guests may wish to use their own vehicles, access our training cars or a mixture of both. Team Building: A series of interactive exercises designed to develop communications and working relationships between team members. The activities will focus on enhancing trust, motivation and overall team performance. The program can be designed to compliment your company's long-term strategies for organisational and personal development. DID YOU KNOW? : We have run these sessions for companies to test "Six Sigma" management principles through shared experiences outside people's comfort zones. Motorkhana Events: Motorkhana, also known to some as Autokana, is a popular and exciting form of motorsport. Participants will focus on cornering and vision techniques while racing off against one another on a tight driving courses marked out of traffic cones. This usually requires sliding and spinning the car accurately while maintaining speed. A fun and challenging task. The ultimate test of nerve, co-ordination, speed and ability to remain in control against the clock! NOTE: This is an inexpensive, fun and interactive activity, that can take place at any venue. By using a common car, all participants can compare their times. Skid Pan Driving: This session is conducted on a super-slippery skid pan and allows participants the opportunity to understand the causes of and recovery techniques for skids and slides. 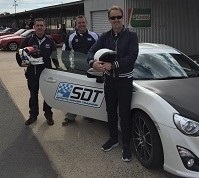 The program commences with SDT Instructors riding in-car offering personalized one-on-one training, then participants can drive solo to refine their skills. The program can involve a number of race-the-clock team driving events. 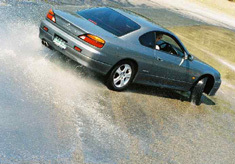 NOTE: There is only a limited number of venues with a skidpan available. Go-Kart Racing: Guests can undertake competitive race events in high powered go-karts. Depending on time and budget, practice sessions, qualifying and race formats can be scheduled. Overalls and helmets will be supplied for safety and to keep the guests relatively clean. Trophies can be arranged for the best drivers. NOTE: This activity can only occur at venues near to go-karting tracks. Typically go-karting requires 1 - 2 hours. Age, height and weight limits apply for karts. Fast Car Hot Laps: Put yourself in the passenger seat and hold on tight as you're in for the ride of a lifetime! This is perfect for any driving enthusiast who wants to experience driving at high speeds! NOTE: This activity can only occur at venues with racing or driver training circuits. Drift "Slide of a Lifetime": Drifting is the art of high-speed sliding in a controlled environment. Each participant will be taken for an unforgettable SLIDE OF A LIFETIME as a passenger in a real drift car. This exhilarating and powerful experience will leave you breathless at every turn of the wheel. The adrenalin rush is unforgettable!! Rally Car Rides: You've seen it on TV, but now it's your turn to experience what it's like in real life. You get strapped into the race seat and race harness belts, and with your helmet on. hang on for an adventure in driving! Watch the dust fly as your driver accelerates to awesome speeds to send you on an adrenalin rush you'll never forget! Stunt Driver Training: We can run intensive sessions on stunt driving manoeuvres such as handbrake spins (90 and 180 degree), spins into parking bays, J-turns (reverse 180 degree spin and go), power-slides, burnouts and performance driving. Race Car Rentals (self-drive): If your guests would rather drive than be taken for passenger rides on a real race circuit, we can source race-prepared cars. Instructors then ride in-car and provide 1-on-1 coaching to each driver on the techniques of circuit driving. Drag Experience (self-drive): Participants get to complete a real 1/4 mile pass on a dragstrip. For safety, only single car (solo) passes are run, not head-to-head races. However participants will get advice on the operation of the "Xmas Tree Lights" at the start of the dragstip and how to stage their vehicle and launch. Timing equipment will be fitted to the car which will show 1/4 mile time and top speed. Helmets will be supplied for safety. Trophies can be arranged for the fastest drivers. If required Safe Drive Training can erect signage/banners at the venues and place stickers on the fleet of training vehicles. Safe Drive Training can supply a fleet of cars for participants to utilize in various driving events that range from Advanced Driver Training exercises, to challenging timed driving and team-building events. We can organise catering ranging from platters of foccacias filled with meat and salads, to a BBQ lunch or even a 5-star gourmet business lunch with waiter service.